Living and working abroad comes with many exciting benefits. In addition to exploring new lands and learning about new cultures, expats often earn additional income beyond regular salary. Foreign earned income can come in many forms. In addition to the earned wages, those who are working outside the U.S. also must declare as income bonuses, tips, commissions, and the like. It is also common for expats working overseas to have noncash income as part of their employment package. This can include housing, meals, use of a car, and various other allowances. For example, such as family education benefits for your children and cost of living adjustments. Taken together, these sources form your total foreign earned income. 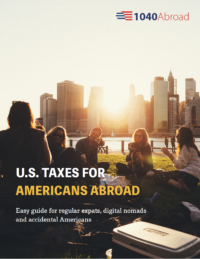 Not sure if you are a US person for tax purposes? Check out this article to find out! Form 2555: Show me the money! As you know, US citizens and resident aliens must declare and pay tax on their global income even if they are living in another country. It is possible to reduce your tax liability by completing Form 2555 or Form 2555 EZ. These forms are used to calculate the total amount of money that a person may be eligible to exclude from taxation under the Foreign Earned Income Exclusion and Foreign Housing Exclusion. If you are not claiming the Foreign Housing Exclusion you should use Form 2555 EZ. It is shorter and thus faster to complete. If you intend to take both deductions, you must complete the regular form. Foreign Earned Income Exclusion (FEIE): This is the amount of income earned from a foreign source that can be excluded from US taxation. It is available to US persons who are living abroad for a specified duration of time during the tax year. The deduction is not automatic; expats must elect to take it. Foreign Housing Exclusion (FHE): If your housing expenses are paid for using money from your employer, either an allowance or regular income, you may qualify to deduct that amount from your taxable income as well. The maximum amounts vary by country. Generally, they are no more than 30% of the maximum Foreign Earned Income Exclusion for the given tax year. Want to learn more about deductions and credits you may be eligible for? Click here! How does the Foreign Earned Income Exclusion work? When you report income earned abroad, you can exclude from taxable income the amount earned up to the IRS limit. It is adjusted for inflation each year. For the 2017 tax year, the exclusion amount is $102,100. This means that if you make less than that amount you will pay zero in federal taxes. Sweet! If you make more than the allowed amount, you will pay US federal taxes on the excess. For example, if you make $250,000 this year and qualify for the FEIE your tax owed will be calculated on only $147,000 ($4250,000-$102,100). The good news is that this applies to people individually, and thus a married couple can claim a deduction up to $204,200 combined. Bear in mind this exclusion is only for foreign earned income. This exclusion doesn’t apply if you have US sourced taxable income. Of course, there are some hurdles that you will need to jump through in order to qualify for the FEIE. First, you must qualify in one of two ways. What are the residence tests to qualify for Foreign Earned Income Exclusion? A person who is physically out of the United States for at least 330 days in any 12 month period. It is not necessary for you to be in the country where you are working during that time. The only requirement is that you are not in the good old U.S. of A. It is common for people in their first year of placement abroad or for those who only intend to be abroad for a limited amount of time to use this calculation to qualify for the FEIE. This is also the choice for digital nomads and others who move around frequently and thus cannot establish a home base. If you obtain legal residence in a new country and intend to stay there for the foreseeable future, the residency test is the way to go. Once you establish the new country as your home base, the place you return to when you travel and where you will establish your family roots you will have much more freedom in the amount of time you can spend in the US (currently up to 4 or 5 months a year). To help you figure out which test is right for you, we have created this handy tool. In addition to establishing your residency via either the physical presence test or the bona fide residence test, you must also meet the tax home test. A tax home is where you have your principal place of employment or business, even if this is not the same location of your family residence. If you do not have a principal business location, then your tax home is where you reside. Is your Foreign Earned Income working for you? You work hard. You deserve every benefit afforded by the IRS to keep more of your hard-earned money. By educating yourself on the various tax affordances available to you, such as the Foreign Earned Income Credit, you may be able to hold on to more of what you earn. Don’t let this benefit slip through the cracks. You must complete Form 2555 or Form 2555 EZ and file it along with your return. If you need help, contact us! Bonus tip: Taking the time to complete Form 2555 could save you boatloads of money. Do it! Sign up for our free Foreign Earned Income Credit tool to help you determine which test is right for you. What does US expat need to know about Child tax credit? Hello, from previous years there used to be line 21 in the Imcome section that an amount from the 2555-EZ could be entered. Where has that line gone in the 2018 1040 form? !